What makes us most secure? Is it enabling the police and intelligence agencies to unlock digital devices and listen to communications? Or is it securely protecting devices and communications against intrusions? Two events in 2016 painted this issue in sharp contrast. In February 2016, the FBI tried to compel Apple to open the locked iPhone of a San Bernardino terrorist. Apple refused, citing threats to iPhone security. Eventually the phone was unlocked without Apple’s help; the battle over encryption continued. Then, in October 2016, the US government announced that Russia had interfered with the 2016 presidential campaign, attacking not only the Democratic National Committee and the Clinton campaign, but also research institutions and civil society organizations. Nor was the US the only target of Russian government attacks; the 2016 French presidential election was similarly targeted. What makes us most secure? In this talk, I will discuss our most serious threats and what’s needed to protect against them. Susan Landau is Bridge Professor of Cyber Security and Policy in the Fletcher School of Law and Diplomacy and the School of Engineering, Department of Computer Science, Tufts University. Landau works at the intersection of cybersecurity, national security, law, and policy. 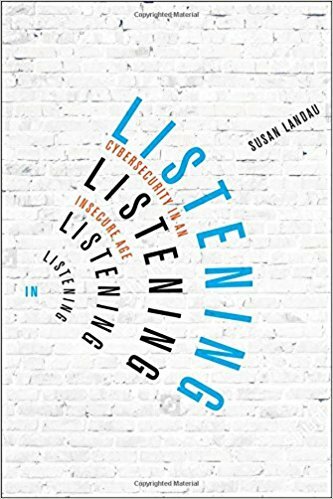 Her new book, “Listening In: Cybersecurity in an Insecure Age,” was published by Yale University Press. Landau has testified before Congress and frequently briefed US and European policymakers on encryption, surveillance, and cybersecurity issues. Landau has been a Senior Staff Privacy Analyst at Google, a Distinguished Engineer at Sun Microsystems, and a faculty member at Worcester Polytechnic Institute, the University of Massachusetts Amherst and Wesleyan University. She is a member of the Cybersecurity Hall of Fame, a fellow of the American Association for the Advancement of Science and of the Association for Computing Machinery.